Black Ice Software - BiBatchConverter version 4.29 is released! BiBatchConverter version 4.29 is released! 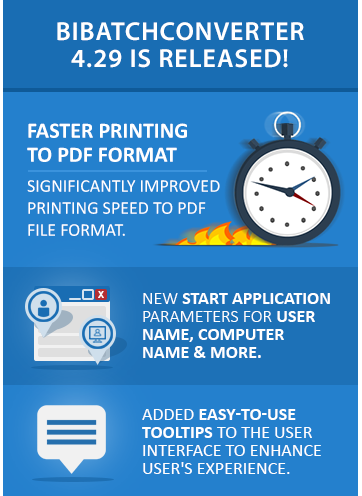 Updated Printer Driver with significantly improved printing speed to PDF file formats and more! Black Ice Software has released the BiBatchConverter version 4.29. The new BiBatchConverter comes with the latest Printer Driver, which includes significant improvements to printing performance when printing to PDF file formats. Faster printing increases productivity by reducing idle time. The latest BiBatchConverter also includes an improved Printer Driver user interface and easy-to-use tooltips to enhance user's experience. The latest BiBatchConverter includes new useful parameters for the Start Application feature, to allow users to pass the User Name, Computer Name, Timestamp, First Bates Number and Last Bates Number parameters to the started application. The new Start Application parameters can be used by Administrators to distinguish the printed documents by User name, Computer Name, or by a Timestamp.